This is a shot I took a couple of years ago of the old Milwaukee Road substation at Loweth, out in Meagher County between Ringling and Martinsdale. Back in its day, the Milwaukee was a technological and engineering marvel -- the longest electrified railroad in the land. A series of 22 handsome and solidly-built brick substations helped keep the system going. The electrification was turned off way back in 1974, though, and the railroad itself disappeared six years later. 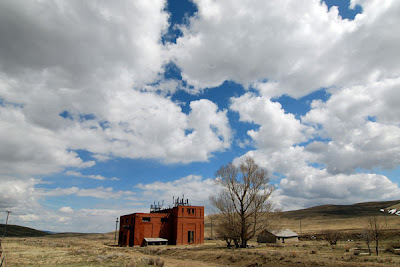 Only four of the Montana substations still remain, quietly standing guard by the old railroad grade, reminders of a failed dream. Oh the Milwaukee Road... such an interesting saga in Montana's history. You have to wonder, if they'd stayed electric instead of converting to deisel, would they have made it through the 1970's energy-crunch? The one on I-90 near Missoula bums me out. There are trees growing out of it, and the building is less than 100 years old! I dunno ... the problem was that by the 1970s the Milwaukee's electrification equipment was ancient, much of it still dating from the 1910s and 1920s. They would have needed a huge pile of money to update it all, and they just didn't have it. There are probably lots of causes for the Milwaukee disappearing out here, but the Burlington Northern merger was probably the biggest one. It's too bad, because the merger combined with the Milwaukee's bankruptcy to basically give BN a monopoly in Montana, and the state has really suffered as a result. Yes, I always wondered about the one I see every time I hit that stretch of I-90! That explains so much! :) If you ever want a friend to go tromping over there let me know we can meet, if you haven't captured it already. Definitely! I've poked around inside the one I photographed here, but not the one you see from I-90 ... I've heard that getting there involves trespassing, though.